Many things have changed in Concord between when Thoreau walked the woods near Walden Pond, and today. Thoreau was used to far more open land and agriculture, and fewer beavers and deer. Today agriculture in Concord has declined, and the land is much more heavily forested. Another major change is the average temperature in Concord. As a result of warming resulting from the urban heat island from Boston and from anthropogenic climate change, the average temperatures in Concord today are much warmer than during Thoreau's time. The graph below shows changes in mean March and April temperature over time between 1853 and 2012. 2010 and 2012 were record warm years. On average the mean spring temperature in Concord has increased by 2.5 degrees C between the 1850s and today. These data were recorded by the Blue Hills Meteorological Observatory. 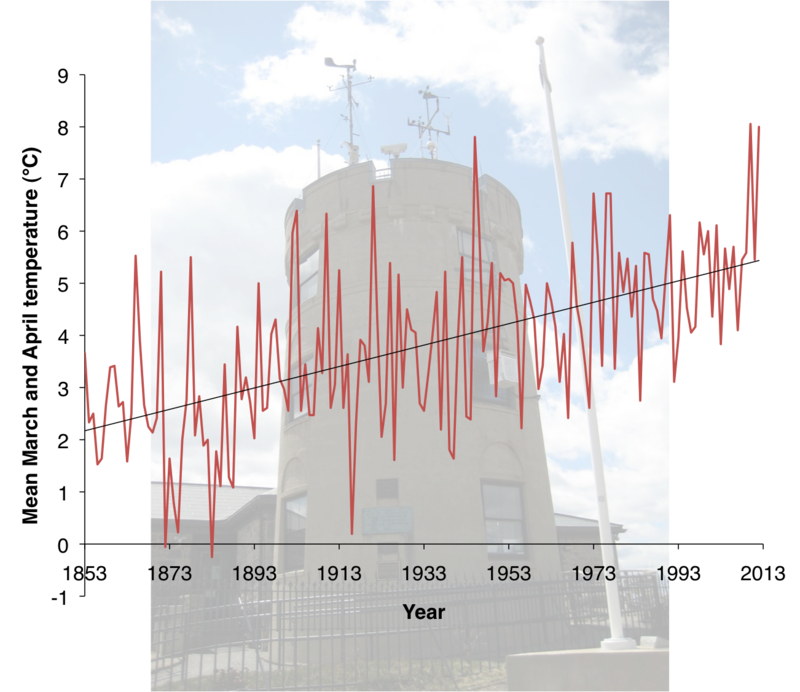 This graph shows the extremely variable spring weather (mean March and April temperature) in Eastern Massachusetts between 1853 and 2012. These data were recorded at the Blue Hills Meteorological Observatory. A warming climate is changing our perceptions of every season, including winter. Ice too thin for skating and walking during the late winter would have shocked Thoreau — it just wasn’t within the realm of his personal experience. On March 11, 1856, he recorded walking out to the middle of Walden Pond and cutting a hole in the ice. He measured a top layer of three to four inches of crusted snow, 11 ½ inches of snow ice, and 12 ¾ inches of solid ice, and concluded, "Snow and ice together make a curtain of twenty-eight inches thick now drawn over the pond. Such is the prospect of the fishes!" Contrast Thoreau’s experience with my visit to Walden Pond on March 14, 2013, when 20 feet of open water extended from the shore to a thin layer of rotten ice covering the middle of the pond. 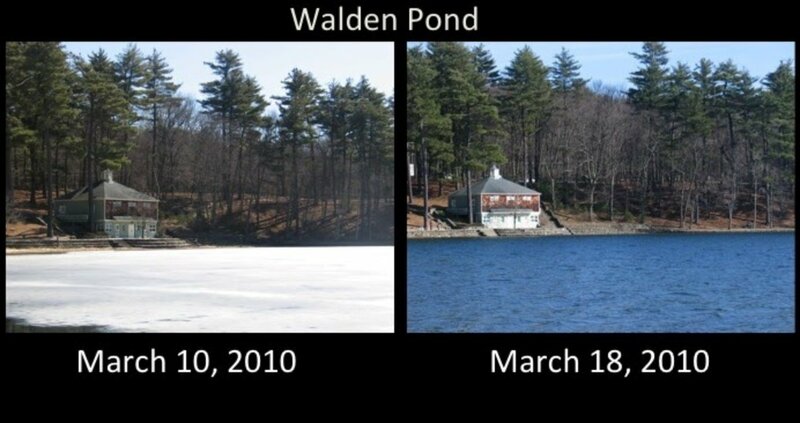 During the warm winter and spring of 2012, there was no ice at all on Walden Pond in February and March. In addition to measuring the thickness of the ice, Thoreau regularly noted the day of ice out at Walden Pond —the day that the ice was no longer present over most of the pond surface — every year for 15 years between 1846 and1860. According to Thoreau’s records, ice out at Walden Pond occurred as early as March 15 and as late as April 18, a five- week range, with an average ice-out date of April 1. This pond never breaks up so soon as the others in the neighborhood, on account both of its greater depth and its having no stream passing through it to melt or wear away the ice. It indicates better than any water hereabouts the absolute progress of the season, being least affected by transient changes in temperature. (Walden, p. 324). In recent years, park rangers and volunteers at Walden Pond State Park have continued this tradition of observing ice-out dates at the pond. Between 1995 and 2009, ice out ranged from February 22 to April 12, with an average of March 17--two weeks earlier than in Thoreau’s time. And in the record-breaking warm year of 2012, a thin ice surface only formed on January 19. Ice-out for the season was recorded only 10 days later on January 29, a startling six weeks earlier than ice-out in Thoreau’s time. Mild winter days and the absence of a thick ice surface, especially in 2012, would have astonished Thoreau, who was accustomed to harsh winters and thick pond ice. Not only is the weather getting warmer, but it is affecting bodies of water like Walden Pond; in turn, the timing of ice-out affects when waterfowl, fish, and other creatures are able to begin their spring activities. I am preparing for my third field season in Maine this spring & summer. Thoreau famously visited Maine in the 1840s and climbed Mt Katahdin. My research is focused on another iconic Maine location — Mount Desert Island — but follows Thoreau’s example as a study of the abundance and flowering phenology of the local flora. As in Concord, we hope to trace changes in the Acadia flora through historical records including herbaria specimens, photographs, field notes, and published flora. In fact, one of the botanists who contributed to the 1894 Flora of Mount Desert Island, ME was a woman named Annie Sawyer Downs. Annie summered on the island in the late nineteenth century, but she grew up in Concord, MA where she spent her childhood botanizing — sometimes rambling into the woods with Thoreau himself. After two seasons of searching through archives, transcribing historical data, and digitizing herbarium specimens, I am looking forward to getting outside for my own flowering phenology monitoring. Hopefully, I will be able to record dates of flowering in Acadia for many of the species studied by Annie in the 1890s, and a few recorded by Thoreau in Concord. In our first ever video blog post, we take you into the heart of our newest experiment! Dr. Richard Primack describes our current winter chilling experiment from the Arnold Arboretum in Boston, Massachusetts. Does the length of winter have an effect on spring leaf-out? Does the effect differ between native and invasive species? Stay tuned to find out!